At the east end of the lower church of Glasgow Cathedral are four chapels. One of these, the Chapel of Saint Andrew, is dedicated to the nurses of Scotland. 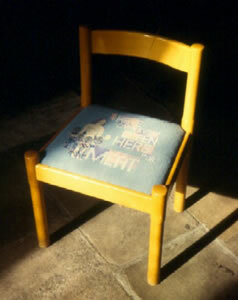 Malcolm Lochhead was commissioned by the Nursing Organisations of Scotland to design eight embroidered chairs to become the focal point of its furnishing. The design was inspired by the passage below which is taken from Genesis 1:29,30.